A new tradition… Originally posted 12.1.08….. Updated version coming to you soon! I saw this idea about two years ago and saved it! Now that Jax is old enough we can do some really fun and amazing things! 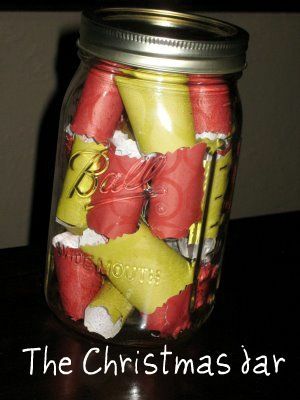 Inside this jar are 25 scrap pieces of paper. Written on them are some awesome activities for us to do. Each morning leading up to Christmas, Jaxon will pick one out of the jar. That evening we will complete the activitiy. It’s not to late to start your jar! Merry Christmas… Happy New Year! i love this! i hope you guys are enjoying the Christmas jar!